Only one thing is needed. Of the many good things that one can do, only one is necessary; only one is better. Mary received this commendation from Jesus because she had sat at his feet and listened to his word. Thus, we have a major problem when we fail to take the opportunity to do just this. But we have a different kind of problem when we do listen, to some degree at least, to Jesus’ word, but then for one reason or another, fail to take him seriously. We are adept at side-stepping his words, choosing only those words which agree with our own perspective, explaining away the words if their challenge is too direct, and so on. To truly listen to his word requires not merely the act of hearing, but reflection on those words so that they might become part of our thought and decision-making processes, and so issue in life-action on the basis of those words. To truly listen to his word is to become a “doer of the word and not a hearer only” (James 1:22). Jesus declares those blessed who “hear the Word of God and do it” (Luke 11:28). It is likely that these words are addressed to Jesus’ contemporaries to warn them that genuine repentance is required if devastating judgement on Jerusalem and the Jewish nation generally is to be avoided. This is a theme of Luke’s gospel, and is found earlier in this same chapter (cf. 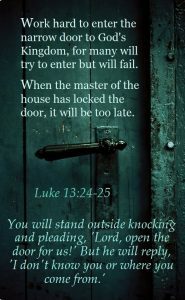 Luke 13:1-9). Now large crowds were going along with Him; and He turned and said to them, “If anyone comes to Me, and does not hate his own father and mother and wife and children and brothers and sisters, yes, and even his own life, he cannot be My disciple. Whoever does not carry his own cross and come after Me cannot be My disciple. … So then, none of you can be My disciple who does not give up all his own possessions. Those who would follow Jesus must ‘hate’ all other relational claims on their lives, and even their own life as well. We cannot cling to our ‘loves’ if we would follow Jesus. Rather, we are called to take up the cross daily—die!—and follow Jesus. There is a cost to discipleship which will cut to the very core of our existence, including the giving up of all that does not belong in his kingdom, and of all that challenges our sole allegiance to him, whether our ‘possessions’—literally and figuratively—our loves, or our relationships. If it comes down to a choice between Jesus’ words and a response whereby we ask, “Yes, but what about…?”, go with Jesus every time.